This entry was posted on Monday, June 1st, 2015 at 12:00 AM	and is filed under Dr. Carter's Case Studies, Dr. Gourley's Case Studies, Superego Cinema and tagged with Alec Guinness, Chewbacca, Irvin Kershner, James Bladon, Jeremy Carter, Matt Gourley, Obi-Wan Kenobi, Pater Mayhew, The Empire Strikes Back. You can follow any responses to this entry through the RSS 2.0 feed. 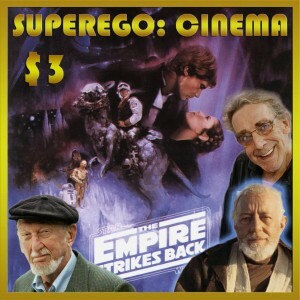 Never heard of this Empire movie before, but heck, I’m a sucker for these Superego boys. Can’t wait for next week’s ‘My Dinner with Andre’ episode. Hilarious. Please do more of these! This is so great. Easily the funniest commentary I’ve ever heard. I’ve been listening to it once a week since it was released and I’m still not tired of it. I’m not even a Star Wars fan. I hope this is a success for you guys, because all I want you to do now is do the rest of the Star Wars movies as these characters. Why is it unavailable? When will it be back? A commentary for Alien by H.R. Giger would be the best thing ever, just saying.